Are you frustrated before you even make it to the bathroom in the morning? This isn't a pipe dream...it can be your reality. All you need is a clean, decluttered, and organized bedroom, bathroom, and master closet. Do YOU want a calm and organized master suite? 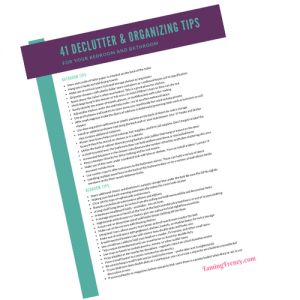 Join the email list to get your declutter and organizing tip sheet and turn your master suite into your happy place. Yes, I want to join the email list and get my tip sheet. Check your email inbox to confirm your subscription and get your tip sheet. ​When you join the email list you'll also get weekly tips and advice to help you get those other areas under control as well. Learn how to tame all the frenzy in your life. except a little clutter and a lot of frustration?